Wakefield's Tom Johnstone is fended off by Castleford's Denny Solomona. YOUNG WINGER Tom Johnstone’s first target for the new season is to be on the field when Wakefield Trinity Wildcats kick off their Super League campaign next Sunday. Johnstone made his debut last year, scoring nine tries in 13 appearances and impressing observers with his pace and finishing ability, but with a stronger squad for coach Brian Smith to pick from, he knows he can’t take anything for granted. “I will be trying to start the season on that wing spot and trying to keep hold of it,” Johnstone said. At just 20, Johnstone is still at the learning stage and admitted he has to be stronger in defence this year if he is going to hold a regular place in the team. “I want to try and get a few more games this year and be a bit more consistent with my performances, because last year they were all over the place,” he reflected. Johnstone is coming to the end of his second pre-season as a full-time player and pin-pointed Smith, the vastly experienced Australian coach, as being vital in his improvement over the past few months. “I think I’ve developed massively,” said Johnstone, who was born in Germany, lives in Leeds and played his junior rugby for Stanningley. “The amount of work we’ve been doing has helped, but mainly how much he has been helping me with my D (defence) and my attack. Owen, who has been given the all-clear to resume playing after recovering from a badly broken leg suffered against Bradford Bulls last August, is another of Johnstone’s mentors. 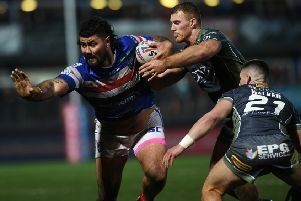 His impending return adds to competition in the outside-backs and Johnstone said the former Castleford Tigers man’s involvement at training is good for the team and him personally. “It is keeping the boys on their toes and it is going to help the team out,” he said. “He brings a lot to the team and he is always helping me on the sideline, telling me what to do and giving me ideas. “When he comes back it will be a really good thing. He is a good person to learn off, he knows so much, he knows nearly everything. Wildcats play host to Widnes Vikings in First Utility Super League round one a week tomorrow. A huge improvement is needed after they finished 11 points adrift at the end of the 2015 regular season, but Johnstone predicted: “I think we can kick on. We want to put last year behind us and build on it. We have got a whole set of new players and we are doing things a lot differently this year.